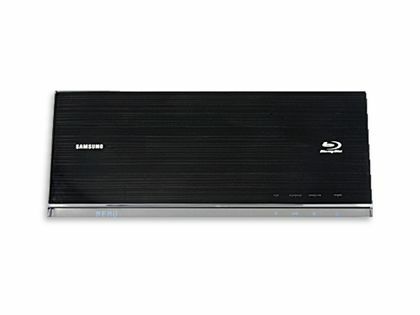 The Samsung BD-C7500 is one of the most distinctive Blu-ray players currently available. With its ultra-slim form-factor, vertical orientation, glossy black finish and wall bracket, it's crying out to be mounted under your flatscreen TV. Nevertheless, the BD-C7500 is still a package of plenty in most respects. A 3.5mm socket provides the only analogue alternative (stereo audio and composite video) to the 1080p24-capable HDMI port. Every other terminal is digital – optical audio, a USB port and Ethernet. In keeping with the ethos of wall-mounted minimalism, there's integral Wi-Fi. In addition to BD Live support, complete with 1GB of cache, are Samsung's Internet@TV platform and a DLNA-compliant networked media player. The C7500 can also deal with compatible files via USB. Internet@TV, borrowed from recent Samsung tellies, provides PC-free access to a selection of web favourites including YouTube, Twitter and Google. Other widgets can be downloaded to the player, where they share the aforementioned 1GB with BD-Live data. Among them are simple games such as Texas Hold 'em, picture galleries, news, weather and even TV listings. BBC iPlayer and LoveFilm are also launching soon, and even now, there's plenty to get your teeth into. And that's before you consider that the C7500 also plays Blu-ray discs, which load speedily courtesy of Samsung's 'Ultra Fast Play' technology – once the disc tray has finished its somewhat tardy dance. With a Samsung full HD 40in LCD TV and the C7500 set to output 1080p24, I was thoroughly impressed with what this designer deck could extract from Blu-ray discs. Moon fared well, to the extent that in the exterior shots, it was possible to identify individual stars against the infinite blackness of space. The saturated hues of instrument panels and subtler flesh tones were conveyed with equal dexterity. Also impressive is the smoothness of movement, compared to the judder of early Blu-ray hardware. Decent DVD transfers stand their ground, with Samsung's upscaling doing an artifact-free job. And while low-bitrate YouTube clips (HD isn't supported) and other AV mediocrity are ruthlessly exposed, well-encoded DivX HD material looks superb. Moving to sound quality, the analogue stereo output is acceptable – but no substitute for the full high-resolution multichannel experience that's only possible here via HDMI. With our Onkyo TX-NR905 AVR and Rogers 6.1 speakers, dynamism is on tap – as is subtlety when it's called for. Overall, a decent 'lifestyle' package.